Dough sheeter for pasta factories: brighter colour and better firmness when cooked. Two solutions for pasta sheets, with or without vacuum - only one goal: top quality pasta! Total reliability, quality products and extremely easy to clean - these are the common denominators. The pasta sheet made with the TV vacuum technology comes out yellower and retains better firmness when cooked. The best results on the market are provided by the STF TV model, thanks to the vacuum system and its exclusive avant-garde technology: the sturdiness of the dough kneading system makes it ideal for producing long ribbon pasta (tagliatelle) or for filled pasta. Specially for medium- and large-scale plants. The VSF TV model applies vacuum technology to a kneading system designed specifically for producing softer sheets for filled pasta: the best cost/performance compromise. 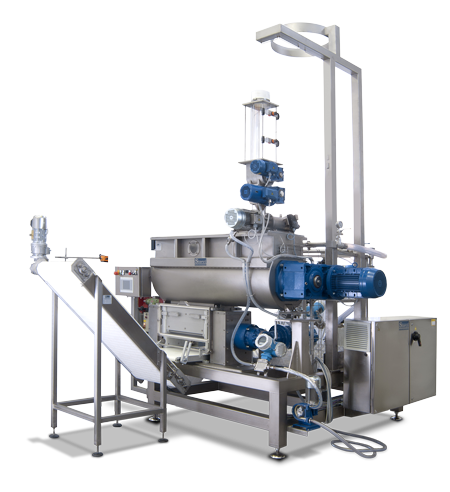 All models offer the simplicity of dosing systems incorporated in the Premix® dough preparation unit, complete with automatic dosing of dry and liquid ingredients. The pasta sheet produced using Storci's patented vacuum lamination system is yellower (+18%) and brighter (+12%). Firmness during cooking is 20% better, the consistency increases thanks to a greater strength (+60%) and extensibility (+25%). The pasta is more "al dente" with greater firmness to the bite and less stickiness. The pasta maker can adjust the vacuum level during the kneading and lamination processes: this is for markets where consumers prefer their pasta to be softer and not quite so yellow. The results obtained in university tests are very significant and attest to the important features of the new Total Vacuum TV series dough sheeters, characteristics that have prompted many pasta production plants in Italy and abroad to choose them over traditional machine. The pasta laminated under vacuum is yellower (+18%) and brighter (+12%) than pasta laminated without the use of vacuum. Parameters L* (brightness), a* (red index), b* (yellow index) for sheeted pasta samples . Parameters L* (brightness), a* (red index), b* (yellow index) for sheeted pasta samples. 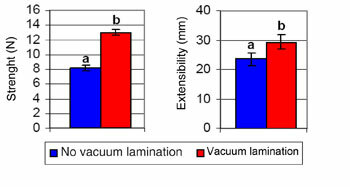 The texture analysis highlights how the dough sheets laminated under vacuum are stronger (+60%) and more extensible (+25%) than those laminated without the use of vacuum. Parameters for strength (maximum force [N] required to break the sample) and extensibility (strain at rupture [mm]) of the dough sheet samples. 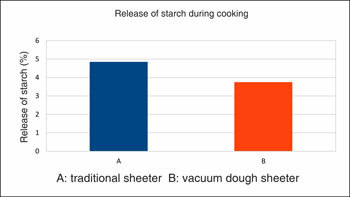 The firmness during cooking of the pasta made under vacuum is 20% higher (sample B) compared to the pasta made with a traditional sheeter (sample A). The reduced release of solids into the cooking water is an indicator of excellent quality and makes the pasta produced using Storci technology special. Graph 1: data analyzed using the Minolta CM2600d colorimeter (Minolta Co., Osaka Japan). The spectral curves were determined over a range of 400-700nm, using illuminant D65 at 2° standard observer; the letters above the histograms indicate the significant differences between the pasta dough samples produced using the two different technologies (p<0.05). Graph 2: data analyzed using the Texture Analyzer TAXT2 (Stable Micro Systems, Goldalming, UK); uniaxial compression test; spherical polypropylene probe (Ø2.54mm); compression rate of 3mm/s. The letters above the histograms indicate the significant differences between the pasta dough samples produced using the two different technologies (p>0.05). Patents: no. 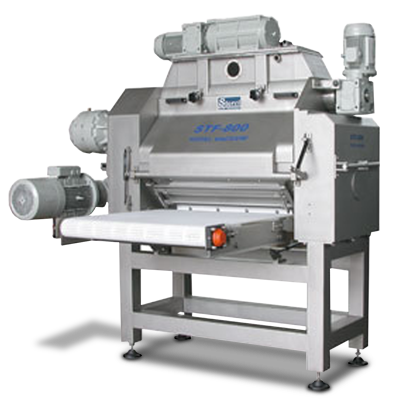 1322296 registered 31 April 2004 - Sfogliatrice gramolatrice per paste alimentari e procedimento di sfogliatura gramolatura (Dough kneader-sheeter machine for pasta and kneading and sheeting process); no. 1642503 B1 registered 14 March 2012 - Vacuum dough rolling apparatus.